Add cable rail to your existing wood deck railing? It's easy with Insta-Rail Vertical Cable Railing. 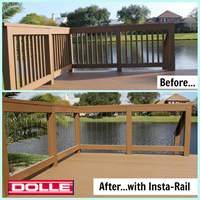 Insta-Rail can be used on new or existing wood frame deck rails to replace existing balusters, pickets, or wooden spindles. Insta-Rail Vertical Cable Rail installation is designed to be DIY friendly and can be easily installed with common, basic tools. Each 36" or 42" kit contains everything needed for one 6' rail section.